in the Black Forest (Photograph by Galli) As there was a profusion of idols in pagan times, it was difficult for the Church to represent Jesus Christ and the saints as figures in pictorial or plastic form. Above the altars there were usually only empty crosses and fish symbols. But as relics, which symbolised the presence of the saint ‘in persona’, became increasingly popular, it became necessary to find fitting places to keep these items. In addition to shrines, busts and caskets, people also made figures which were partly hollowed out to keep the relic or the host in. It was not until after the year 1200 that sculptures were made for their own sake, and in the baroque period, they again became extremely popular. The monastery sculptor Matthias Faller, the son of a Black Forest farmer and the most gifted pupil of the Baroque sculptor Josef Anton Feuchtmayr, created in ‘his’ church in St. Märgen several larger-than-life statues, including the golden statue of Saint Ubald of Gubbio, at whose feet a sick man writhes who appears to be having a grand mal seizure. The archbishop of Vienne, who died in 1001 and whose saint’s day is on May 21st; then his nephew Theobald of Provins (or of Thann), who was canonised by Pope Alexander II in 1073 and who is remembered on June 30th. Finally there is Saint Ubald of Gubbio, an Augustinian choir leader, whose saint’s day is on May 16th, and who is often confused with Saint Theobald from Thann. People in south Baden and in neighbouring Alsace call upon both saints to help them when they are in a desperate situation and when they have the ‘holy sickness’ (epilepsy). As both men also made the pilgrimage to Santiago de Compostela, after which they withdrew from the world and lived in solitude, the individual identity of the two saints is not always clear. There are many legends about Saint Theobald of Thann which were written down in an extensive folio between 1402 and 1521. In this work there are several stories of people being cured of the falling sickness. Such a curing is depicted in this sculpture. The sick man is kneeling at the feet of the saint in a contorted position; his left arm is stretched upwards as if begging for help; his right arm points downwards, the body thus forming the figure of the cross, the symbol of suffering. The man’s head is bent in an unnatural way towards his right shoulder, his mouth and eyes are open, his facial expression shows the torment of a person with epilepsy. As is often the case with such portrayals, the epileptic man is only half dressed-this symbolises his wretchedness and his status as an outcast. 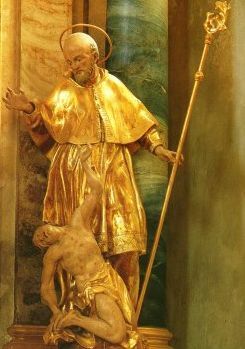 Saint Urbald, dressed as a choir leader of the Augustinians (whose possessions also included the monastery in Sankt Märgen) stands behind the sick man in a relaxed position. In his left hand he holds a staff as the symbol of his religious rank; his right hand is held over the man to bless him. The figures, especially the epileptic man, are portrayed with the typical baroque exuberance of form and movement, which brings out the drama of the situation particularly well.